My very first blogging attempts were made at Yahoo 360 which is now closing. Thankfully, WordPress has let me upload them and now they are a part of this blog. The kids look SO tiny! Until recently, I had completely forgotten about J and his mortal fear of cats. Weasley sweater redux, EZ saves us again. 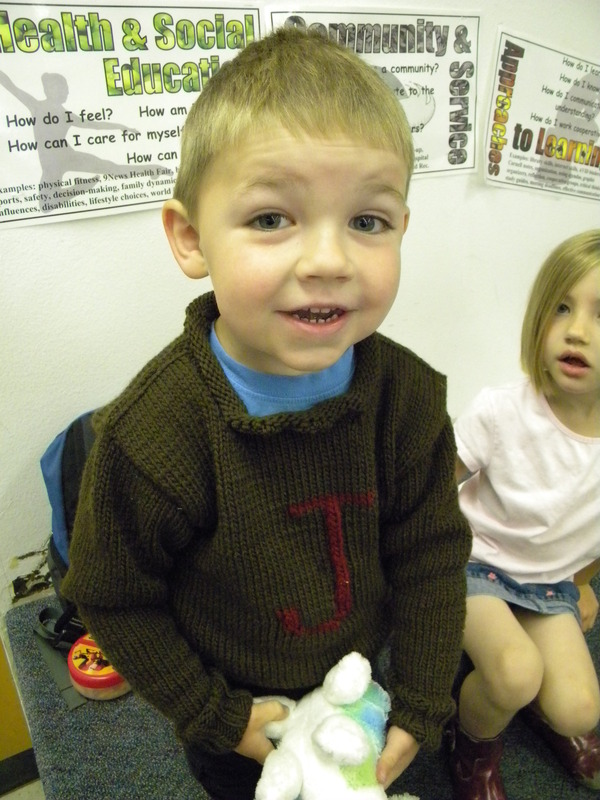 So, if you remember, the boy was in such a hurry to wear the sweater in 90 degree weather, that I completely bungled the bind off to fit over his gigantic head. Well, now the weather is unseasonably chilly, so, of course, he’s outside in his sandals and tee shirt. And shorts. Hopefully. 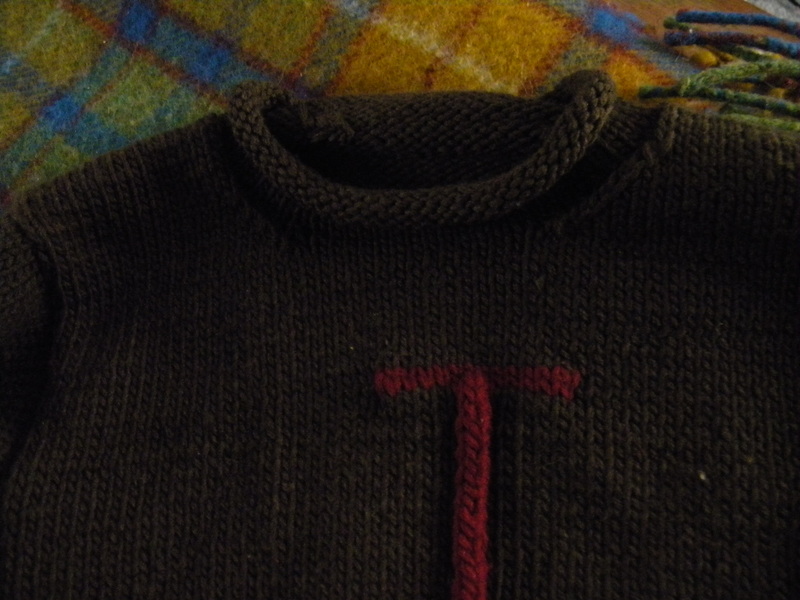 I figured now was a good a time as any to take possession of the aforementioned sweater and fix it. Frogged it back quite a bit and used the Elizabeth Zimmerman sewn bind off(which is absolutely my new favorite bind off. SO easy! or EZ! heh. I’m so funny.) It looks so much better. EZ bind off. MUCH better. And it fits over his head. What I did this summer, or How I got a new rack. So the surgeon called today and my mastectomy and reconstructive process will begin Monday, July 6th. I still have two pre-op appointments, one with the surgeon who will be doing the mastectomy (the one who knits 🙂 ) and one with the plastic surgeon. I’m not looking forward to the pain, the drains (all 6 of them! ); spending another summer somewhat out of commission. But I am looking forward to no mammograms and no prosthesis. Why yes! Those ARE Easter cupcake wrappers. It all started because there are a million (OK. 3. And they’re really 7, but close enough.) 6 year olds in our neighborhood and no 3 year olds. Sometimes I try to give the girl a break from her brother, but as you can imagine, the boy is not too keen on this plan. So I coax with a little off the top of my head ideas like, “Want to help Mommy make cupcakes?” Which works because he loves to cook and loves cupcakes. Who doesn’t really? So we make the cupcakes, using a standard dollar box of yellow cake mix. Except Mommy is a health freak so she omits the oil, adds a 1/2 cup of applesauce, adds a 1/4 cup of flour (though some days it’s wheat germ…) and uses 1/2 cup of egg substitute instead of eggs (I also use egg whites sometimes.) 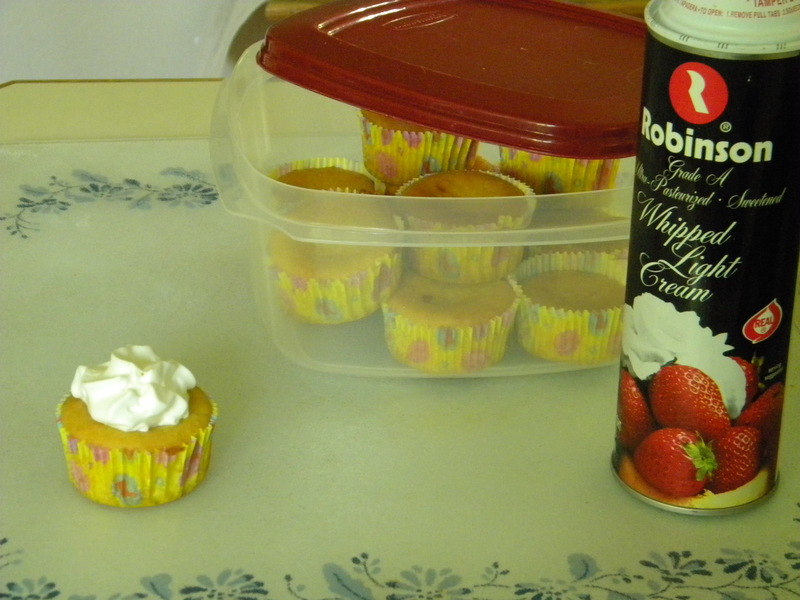 We bake our cupcakes and after they’re cooled, I go for the frosting that I’m sure is in the cabinet. Which isn’t. Luckily, there is a can of light whipped cream in the refrigerator. Voila! Inside out Twinkies. Without all the chemicals. Pretty sure these don’t have the same shelf life, but I think they taste much better.